After Marc Lasry (Lasry) and Wesley Edens (Edens) purchased the Milwaukee Bucks (Bucks) in 2014, the new Bucks owners immediately got to work making preparations to build a new, state-of-the art arena and sports and entertainment complex in downtown Milwaukee. Lasry and Edens hoped to use a combination of public and private funding to finance the project. If the new owners failed to finalize a plan for a new arena and start construction by 2017, the National Basketball Association, per the reported terms of the team sale, had the option, and authority, to relocate the Bucks. The new Bucks arena will cost approximately $500 million dollars. Lasry and Edens, along with former owner and ex-Senator Herb Kohl, have promised a combined private infusion of capital of $250 million for the project. Lasry and Edens are set to contribute $150 million while Kohl will provide the other $100 million for the private funding of the arena. This left a funding gap of $250 million the Bucks owners hoped to receive from the State of Wisconsin, City of Milwaukee, and Milwaukee County. The arena funding bill, Senate Bill 209, (the Bill) went before the Senate on July 15, 2015 and was approved by a 21-10 vote. In order to pass the Senate, one major amendment was added to the proposed funding plan. The Senate removed a provision from the Bill that would have allowed the State of Wisconsin to collect unpaid debts owed to Milwaukee County, which then could have been used to help Milwaukee County pay their portion of the arena funding. Additionally, a $2 surcharge for all tickets sold at the new arena was added to the Bill in place of the uncollected debt provision. The $2 surcharge is expected to generate about $2 million dollars annually, with 75% of the surcharge going to the Wisconsin Center District and the remaining 25% going to the State’s general fund. The next hurdle the arena funding bill had to pass was the Wisconsin Assembly, which also voted in favor of the public funding for the arena by a 52-34 vote on July 28, 2015. Governor Scott Walker, who has been supportive of the plan to keep the Bucks in Milwaukee from the beginning, often reiterating that “it is cheaper to keep [the Bucks],” signed the bill into law on August 12, 2015 at the Wisconsin State Fair. For Gov. Walker, the arena is a “fiscally responsible” plan, stating that “for the state of Wisconsin, it [is] less than $4 million a year to protect $ 6.5 million [the state] collect[s]. And over the next 20 years, that grows to a total of just shy of $300 million the state collects in income taxes for less than $80 million.” Gov. Walker said that he would “be a fool” if he didn’t support the bill. Senate Bill 209 became 2015 Wisconsin Act 60 (Act 60) upon Walker signing the Bill into law. Today is a truly historic day for Milwaukee and Wisconsin, and the culmination of months of hard work from an incredible coalition passionate about our community’s future. Thanks to the support of Sen. Kohl, Mayor Barrett and the Common Council, and other elected officials in both Milwaukee and Madison, this transformative public-private partnership is now a reality. Now it’s time to get to work creating jobs and building a better Milwaukee – not just for the Bucks, but for all citizens of this great state. Today marked a tremendous milestone in our endeavor to build a world-class sports and entertainment district in Milwaukee, as the city’s Common Council voted overwhelming in support of this public-private partnership. With financing approval in place, the real work begins. Very soon we’ll be able to get shovels in the ground and get to work transforming this city. We couldn’t be more excited. As we’ve said from the very beginning, our vision has been much bigger than just building a new arena. We want to build a better Milwaukee . . . We [are] going to create jobs, we [are] going to create an amazing urban community to help revitalize and connect the city, and we [are] going to keep the Bucks home in Wisconsin. The public funding for the Bucks arena is divided between the State of Wisconsin, the City of Milwaukee, Milwaukee County, and the Wisconsin Center District. $250 Million in public funds are set to be contributed to the development and construction of the new Bucks arena. The $250 Million contribution approximates $400 Million with interest over 20 years. Wisconsin Center District: $93 Million. The Milwaukee Common Council approved the City’s contribution of $47 Million to the new Bucks arena in a 12-3 vote on September 22, 2015. The public plaza will be located between the new arena and the entertainment district on 4th Street between Juneau and Highland at the site of the existing parking structure that will be demolished. $35 Million will be used for a 1,243-space parking garage pursuant to Act 60, section 229.461(3)(d). The parking structure will be located on the Park East land, east of N. 6th Street and north of W. Juneau Ave. The $47 Million will be repaid through the creation of two tax incremental financing (TIF) districts. Two amendments were proposed by the Common Council: (1) a 50-50 split of naming rights revenue gained from the city constructed parking garage; and (2) the closing of 4th Street. Under Act 60, the Bucks are entitled to receive all revenues related to naming rights and from parking. However, the City of Milwaukee and the Bucks have agreed to split the revenue from any naming rights for the new parking garage. The City’s half of the revenue will go to “Common Ground,” and the organization will use the money to build playgrounds. The decision whether to leave 4th Street open or to close 4th street for the public plaza was set aside and will be discussed at a later time. The Zoning, Neighborhoods and Development Committee suggested closing that area of 4th Streets for games, but otherwise leaving the street open. The state will contribute $4 Million per year. Pursuant to Act 60, section 229.48(1), the Wisconsin Center District will “issue bonds for costs and purposes that are related to . . . [a] sports and entertainment arena or sports and entertainment arena facilities.” Under the legislation, costs and purposes include the construction of a new arena. The bonds issued to the State of Wisconsin will be paid by state taxpayers in order to finance their portion of the funding. The 25% ticket surcharge going to the State is projected to generate $500,000 per year, which will go towards the State’s portion of the arena funding and reduce the State’s contribution to approximately $3.5 million per year. Milwaukee County will contribute $4 Million per year or $55 Million dollars. The County’s contribution approximates $80 Million with interest. According to Section 79.035(6) of Act 60, “beginning with the distributions in 2016 and ending with the distributions in 2035, the annual payment under this section to a county in which a sports and entertainment arena . . . is located shall be the amount otherwise determined for the county under this section, minus $4,000,000.” Thus, Milwaukee County’s state aid payments will be reduced by $4 million dollars until their portion of the arena contribution has been satisfied. The uncollected debt provision, which was removed from the original Senate bill and replaced by the $2 ticket surcharge, may be implemented by the County if approval is received from County treasurer and clerk of circuit courts. This plan would transfer from the County to the State the ability to collect unpaid debts and taxes owed to the County to be used for the County’s portion of the funding. Milwaukee County is set to vote in Fall 2015 to approve the County’s portion of the financing and determine how the County will raise the funds to contribute their portion of the funding. Under Act 60, the $2 surcharge on all tickets sold at the new arena will be divided between the State and the Wisconsin Center District. “[Twenty-five] percent of the amount received under this section [shall be distributed] to the Department of Administration for deposit into the general fund and [the board of directors] shall retain the remainder for the district.” The proceeds from the $2 surcharge on all tickets sales at the new arena will be used to help the Wisconsin Center District fund their $93 Million contribution. The Wisconsin Center District will collect local taxes from “hotel rooms, rental cars, food and beverage” taxes under Act 60 section 70.11(37). Act 60 modifies the composition of the existing Wisconsin Center District by adding two additional members to the current 15-member board. The two additions to the District are minority leaders of the Senate and the Assembly, which brings the board composition to 17-members. The current board’s terms will end upon the effective date of Act 60, meaning that the old board will be replaced by an interim board during the construction of the arena. The Secretary of Administration will serve as chairperson of the board of directors until the construction project is complete. The Secretary of Administration, Scott Neitzel, will thus take over for former District chairman Frank Gimbel. Under section 299.41(12), the Bradley Center Sports and Entertainment Corporation will transfer to the District the facilities formerly owned by the Corporation, i.e. the Bradley Center. The Wisconsin Center District, per the legislation, will now be responsible for not only the Bucks new arena, but also the UW-Milwaukee Panther Arena, the Milwaukee Theater, the Wisconsin Center, and, pursuant to section 229.26(4m), the Marcus Center for Performing Arts. After the construction of the arena is complete, a new board will take over for the interim board. Once the construction is complete, the Secretary of Administration will issue a certification of the completion and certain board appointments will be accepted at that time (i.e. the appointments made by the County executive). The new Milwaukee Bucks arena and sports and entertainment district will be constructed between Fourth and Sixth Street and between State Street and McKinley Avenue. The land, commonly referred to as the Park East Property, sits just north of the current BMO Harris Bradley Center and was sold by the County to Head of the Herd, LLC, the development group for the Bucks, for $1 on September 9, 2015. The land is valued at $8.8 million. However, this price does not include the costs associated with the property, such as the removal of the current underground sewer system and the removal of underground footings in place from the former freeway, which could total upwards of $9 million dollars in costs to be paid by the Head of the Herd, LLC. The Bucks will also contribute $8 million to the parking structure constructed by the city, which will ultimately be repaid through the developer TIF. The City’s $12 million share, plus interest, must first be repaid before the Bucks will be repaid their portion of the parking structure. The Wisconsin budget bill, which was signed in July 2015, gives Chris Abele, Milwaukee County Executive, the ability to sell the Park East land to the Bucks without getting County Board approval beforehand. Before the Wisconsin Center District signs a Development Agreement with the Bucks (negotiated by the Secretary of Administration) as per section 229.461 of Act 60, the Bucks owners are required to sign a non-relocation agreement with the City. The non-relocation agreement is included in the Buck’s 30 year lease for the Park East Property, with an option to extend the lease an additional five years. Section 229.461(3)(a) states that “the term of the lease [between the district and the professional basketball team] shall be for 30 years, plus 2 extensions of 5 years each, both extensions at the professional basketball team’s . . . option.” The 30-year non-relocation provision prohibits the Bucks from moving to another city, state, or municipality for 30 years. Additionally, in the event that the Bucks are bought by new owners, per the terms of the lease, “the professional basketball team shall ensure that any person who acquires the professional basketball team . . . commits to acquire the professional basketball subject to the team’s obligations under the non-relocation agreement.” During the term of the lease, the Bucks will “be responsible for equipping, maintaining, operating, improving, and repairing sports and entertainment facilities that are constructed pursuant to a development agreement.” Act 60 also requires the Bucks to pick up the costs for any improvements that the arena might require throughout the term of the lease. 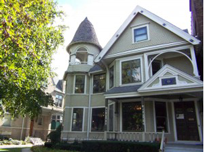 In addition, the lease contains provisions relating to the current BMO Harris Bradley Center. The lease transfers this property to the Bucks, who are then responsible for demolition and all costs associated with the demolition and clearing of that property. Once the transfer occurs, the Bradley Center Sports and Entertainment Corporation, which was responsible for the Bradley Center, will be released from all outstanding debts owed to the Bucks. Additionally, the State of Wisconsin will provide for “a one-time appropriation of $10 million GPR in fiscal year 2016-2017 for the existing Bradley Center to retire its obligations and contractual liabilities.” According to Act 60, “the district shall convey fee title to the professional basketball team . . . free and clear of all liens, encumbrances, and obligations.” After the demolition, “the Bradley Center Sports and Entertainment Corporation shall transfer to the district the land described in s. 229.41(11)€ that is owned by the Bradley Center Sports and Entertainment Corporation.” The land described in section 229.41(11)(e) means the sports and entertainment arena, “the arena structure and the land necessary for its location that is used as the home arena of a professional basketball team and for other sports, recreation, and entertainment activities,” meaning the new Bucks arena will be transferred back under the Wisconsin Center District’s control. The Bucks will ultimately be required to pay any construction costs that are over budget as well, which is included in the Development Agreement. According to the terms of the lease, if the Bucks breach the non-relocation agreement, the Wisconsin Center District has the authority to enforce the lease. The District, the State of Wisconsin, the City of Milwaukee, and Milwaukee County all have the option to enforce the lease individually or collectively and are entitled to injunctive relief or liquidated damages. The amount of liquidated damages would include any outstanding balance to be paid on the arena project and any outstanding interest to be paid. The liquidated damages could also include the amount to maintain the Bucks arena for the remainder of the lease period (as the state, county, city, or district would take control of and run the arena). As mentioned above, the Senate included an amendment to the original bill that requires a $2 surcharge to be placed on all events held at the sports and entertainment arena. The $2 surcharge will be divided 25-75, with 25% of the surcharge (or 50 cents) going to the state and 75% (or $1.50) going to the Wisconsin Center District in order to pay its portion of the funding contribution. And big screen TVs throughout the district showing Bucks games. Construction is set to begin in the Fall of 2015, with the Bucks practice facility and arena being given primary importance. The project is set to be complete in 2018. Lori Shaw is currently a 3L at Marquette University Law School where she is focusing on Intellectual Property and Sports Law. Shaw is the Managing Editor for the Marquette Intellectual Property Law Review, a member of the Marquette Sports Law Review, and a Sports Law Certificate candidate for May 2016. Shaw is also a member of the Employment Law Society and Sports Law Society. Prior to coming to Marquette Law, Shaw double-majored in History and Political Science, with a Psychology minor, at Indiana University in Bloomington, Indiana. NBA Owners Approve Sale of Bucks to Edens, Lasry, NBA.com (May 15, 2014), http://www.nba.com/bucks/release/nba-owners-approve-sale-bucks-edens-lasry. Brian Widnhorst, Source: NBA to Approve Bucks Sale, ESPN (May 14, 2014), http://espn.go.com/nba/story/_/id/10930188/nba-approve-wesley-edens-marc-lasry-new-owners-milwaukee-bucks-thursday-per-source. Don Walker, Bucks Announce Game-Changing $1 Billion Arena Package, Journal Sentinel (Apr. 8, 2015), http://www.jsonline.com/news/milwaukee/bucks-to-unveil-game-changing-1-billion-arena-package-b99477026z1-298990901.html. AP, Wisc. Would Help Fund Bucks Arena, ESPN (Jan. 27, 2015), http://espn.go.com/nba/story/_/id/12236514/plan-help-fund-milwaukee-bucks-new-arena-proposed-wisconsin-governor-scott-walker. Katie DeLong & A.J. Bayatpour, Senate Passes Funding Bill for Milwaukee Bucks Arena in 21-10 Vote; Assembly up Next, Fox6Now (July 14, 2015), http://fox6now.com/2015/07/14/vote-wednesday-on-bucks-arena-funding-plan-all-signs-indicate-senate-will-have-votes-to-pass-it/. SI Wire, Bucks Arena Proposal Passes Wisconsin State Senate, Sports Illustrated (July 15, 2015), http://www.si.com/nba/2015/07/15/milwaukee-bucks-arena-deal-wisconsin-state-senate; 2015 Wisconsin Act § 229.445. Rich Kirchen, Assembly Sets Milwaukee Arena Vote for July 28, but What about the Ticket Surcharge?, MILWAUKEE BUSINESS JOURNAL (July 21, 2015), http://www.bizjournals.com/milwaukee/blog/2015/07/assembly-sets-milwaukee-arena-vote-for-july-28-but.html. AP, Assembly Approves Bucks Arena Deal at $250M Cost to Taxpayers, ESPN (Jul. 29, 2015), http://espn.go.com/nba/story/_/id/13331415/milwaukee-bucks-arena-deal-approved-wisconsin-assembly. Tom Kertscher, Examining Scott Walker’s ‘Cheaper to Keep Them’ Slogan, PolitiFact Wisconsin (June 18, 2015), Whttp://www.politifact.com/wisconsin/article/2015/jun/18/examining-scott-walkers-cheaper-keep-them-slogan/. Katie DeLong, Governor Scot Walker to Sign Milwaukee Bucks Arena Funding Bill August 12th at State Fair Park, Fox6Now (Aug. 4, 2015), http://fox6now.com/2015/08/04/governor-scott-walker-to-sign-milwaukee-bucks-arena-funding-plan-on-august-12th/. Bucks Statement on Milwaukee Common Council Vote, NBA.com (Sept. 22, 2015), http://www.nba.com/bucks/release/bucks-statement-milwaukee-common-council-vote. Zach Rosen, Breaking: The Milwaukee Bucks New Arena Financing 100% Approved After Milwaukee Common Council Vote, Sconnie Sports Talk (Sept. 22, 2015), http://sconniesportstalk.com/2015/09/22/breaking-the-milwaukee-bucks-new-arena-100-approved-after-milwaukee-common-council-vote/. Lee Bergquist & Jason Stein, Scott Walker to Sign Arena Funding Bill Thursday, Journal Sentinel (Aug. 5, 2015), http://www.jsonline.com/news/statepolitics/scott-walker-to-sign-arena-funding-bill-thursday-b99549454z1-320795001.html. Id; AP & A.J. Bayatpour, Wisconsin Assembly Approves Milwaukee Bucks Arena Funding Deal; Gov. Walker Says He’ll Sign It, Fox6Now.com (July 28, 2015), http://fox6now.com/2015/07/28/wisconsin-assembly-approves-milwaukee-bucks-arena-deal/. Fox6 News, Lawmakers, Community Leaders React to Milwaukee Bucks Arena Funding Deal, Fox6Now.com (July 28, 2015), http://fox6now.com/2015/07/28/lawmakers-community-leaders-react-to-bucks-arena-funding-deal/. Tom Daykin, Milwaukee Common Council Votes 12-3 to Approve Bucks Arena Financing Package, Milwaukee Journal Sentinel (Sept. 22, 2015), http://www.jsonline.com/news/milwaukee/aldermen-approve-borrowing-for-the-new-arena-b99581782z1-328671581.html?ipad=y; Bayatpour, supra note 20. Terry Sater, Wisconsin Assembly Passes Bucks Arena Deal, WISN12 (Jul. 28, 2015), http://www.wisn.com/sports/wis-assembly-to-take-up-bucks-arena-plan-tuesday/34394430; Bergquist & Stein, supra note 17; Wisconsin Governor Signs Bill to Fund New Milwaukee Bucks Arena, ESPN (Aug. 12, 2015), http://espn.go.com/nba/story/_/id/13423356/wisconsin-governor-scott-walker-signs-bill-fund-new-milwaukee-bucks-arena; Mary Spicuzza et. al., Scott Walker Signs Bill Clearing Public Funds for New Bucks Arena, Milwaukee Journal Sentinel (Aug. 12, 2015), http://www.jsonline.com/news/statepolitics/scott-walker-to-sign-bucks-arena-funding-bill-at-wisconsin-state-fair-b99555622z1-321544131.html; Daykin, supra note 21. Tom Daykin, City’s Portion of Arena Plan Moves Another Step Forward, Milwaukee Journal Sentinel (Sept. 21, 2015), http://www.jsonline.com/news/statepolitics/citys-portion-of-arena-plan-moves-another-step-forward-b99580869z1-328558061.html. Crocker Stephenson, Another City Committee Backs Bucks Arena Financing, Milwaukee Journal Sentinel (Sept. 16, 2015), http://www.jsonline.com/news/milwaukee/another-city-committee-backs-bucks-arena-financing-b99577658z1-327902021.html?ipad=y. New Bucks Arena Parking Garage, Urban Milwaukee, http://urbanmilwaukee.com/building/new-bucks-arena-parking-garage/ (last visited Oct. 4, 2015); Crocker Stephenson, Another City Committee Backs Bucks Arena Financing, Milwaukee Journal Sentinel (Sept. 16, 2015), http://www.jsonline.com/news/milwaukee/another-city-committee-backs-bucks-arena-financing-b99577658z1-327902021.html. Bucks arena Legislation Stays Out of Budget, The Hamilton Consulting Group (July 8, 2015), http://www.hamilton-consulting.com/blog/2015/07/08/bucks-arena-legislation-stays-out-budget. A.J. Bayatpour, City Leaders Pass Changes to Arena Plan, but Bucks Say It’s Time to Regroup, Fox6.com (Sept. 15, 2015), http://fox6now.com/2015/09/15/not-on-the-same-page-milwaukee-leaders-pass-changes-to-parts-of-bucks-arena-plan/. Wisconsin Senate Bill 209, §229.461(3)(c) (2015). Wisconsin Senate Bill 209, § 229.15(1) (2015). Wisconsin Senate Bill 209, § 229.48(1)(a) (2015). Bergquist & Stein, supra note 17. Wisconsin Senate Bill 209, § 229.445 (2015). Kirchen, supra note 9. Wisconsin Senate Bill 209, § 79.035(6) (2015); Bergquist & Stein, supra note 17. Spicuzza et. al., supra note 23. Partick Marley & Jason Stein, Assembly Passes Arena Deal, Sends it to Scott Walker, Milwaukee Journal Sentinel (Jul. 28, 2015), http://www.jsonline.com/news/statepolitics/assembly-today-is-expected-to-pass-arena-deal-b99545942z1-318870361.html. Wheeler News Service, New Milwaukee Bucks Arena Plan Now in Front of Local, County Lawmakers, WSAU (July 29, 2015), http://wsau.com/news/articles/2015/jul/29/new-milwaukee-bucks-arena-plan-now-in-front-of-local-county-lawmakers/. Kirchen, supra note 9. The Wisconsin Center District is the public board that will control and run the Marcus Center for Performing Arts, the Wisconsin Center Convention Hall, the UW-Milwaukee Arena, and the Milwaukee Theatre. Wisconsin Senate Bill 209, § 229.445 (2015). Wisconsin Senate Bill, §229.42(4)(f) (2015). Rich Kirchen, Frank Gimbel Era Ends on Wisconsin Center District Board; Scott Neitzel in Charge, Milwaukee Business Journal (Aug. 17, 2015), http://www.bizjournals.com/milwaukee/news/2015/08/17/frank-gimbel-era-ends-on-wisconsin-center-district.html. Wisconsin Senate Bill, §229.41(12) (2015). Id. § 229.42(4)(e); Id. §229.435. Bucks Unveil Preliminary Renderings of Downtown Milwaukee Master Development Plan, NBA.com (2015), http://www.nba.com/bucks/release/arena. Milwaukee Leaders Announce Arena Land Sale to Bucks for $1, ESPN (Sept. 9, 2015), http://espn.go.com/nba/story/_/id/13616205/milwaukee-sell-arena-land-bucks-1; Justin Williams, Deal Signed: Land in Milwaukee’s Park East Corridor Sold to Bucks for $1, Fox6Now (Sept. 8, 2015), http://fox6now.com/2015/09/08/announcement-wednesday-land-in-park-east-corridor-to-be-sold-to-bucks-for-1/. Marley & Stein, supra note 49. Id; Sean Ryan, Milwaukee Bucks owners’ $1 Park East Land Buy Supported by Developers, Milwaukee Business Journal (June 23, 2015), http://www.bizjournals.com/milwaukee/blog/real_estate/2015/06/milwaukeebucks-owners-1-park-east-land-buy.html. Marley & Stein, supra note 49; Don Behm, Budget Gives Chris Abele New Authority in Park East Land Sale, Milwaukee Journal Sentinel (July 9, 2015), http://www.jsonline.com/news/milwaukee/budget-gives-chris-abele-new-authority-in-park-east-land-sales-b99534814z1-312941201.html. Wisconsin Senate Bill, §229.461 (2015). Rich Kirchen, Bucks Arena Lease Includes Non-Relocation Clause; Could Move After 30 Years, Milwaukee Business Journal (Jun 30, 2015), http://www.bizjournals.com/milwaukee/news/2015/06/30/bucks-arena-lease-includes-non-relocation-clause.html; Wisconsin Senate Bill, §229.461(2)(g) (2015); Wisconsin Senate Bill, §229.461(3)(a) (2015). Wisconsin Senate Bill, § 229.461(3)(a) (2015). Wisconsin Senate Bill, § 229.461(2)(f) (2015); Kirchen, supra note 71. Wisconsin Senate Bill, § 229.461(3)(c) (2015); Bergquist & Stein, supra note 17. Wisconsin Legislative Council Amendment Memo, 4; Wisconsin Senate Bill, §229.641(3)(c) (2015). Wisconsin Senate Bill, §229.461(3)(b) (2015). Bucks arena Legislation Stays Out of Budget, supra note 31. Bergquist & Stein, supra note 17; Spicuzza, supra note 23. Wisconsin Senate Bill, § 229.461(4) (2015). Id. § 229.461(3)(c); Rich Kirchen, Bucks Would Sign 30-year Arena Lease, Collect All Event Revenue: Fiscal Report, Milwaukee Business Journal (Jun. 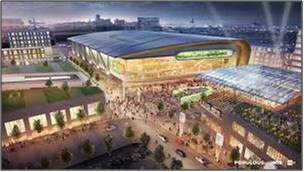 29, 2015), http://www.bizjournals.com/milwaukee/news/2015/06/29/bucks-would-sign-30-year-arena-lease-collect-all.html. 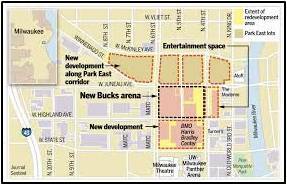 Andre Gruman, Bucks Unveil $1B Plan for New Arena, Entertainment District, FoxSports (Apr. 8, 2015), http://www.foxsports.com/wisconsin/story/milwaukee-bucks-unveil-1b-plan-for-new-arena-entertainment-district-040815; Ryan, supra note 66; Marley & Stein, supra note 49; Rich Krichen, Wisconsin Senate Approves $250M Funding Plan for Milwaukee Bucks Arena, Milwaukee Business Journal (July 15, 2015), http://ww.bizjournals.com/milwaukee/news/2015/07/15/state-senate-approves-250m-arena-funding-plan-21.html; Sean Ryan, Bucks Owners Buy Old World Third Street Lot Near Arena Site, Milwaukee Business Journal (July 2, 2015), http://www.bizjournals.com/milwaukee/blog/real_estate/2015/07/bucks-owners-buy-old-world-third-street-lot-near.html.